OhioHealth Chiller North in Lewis Center will be expanding over the summer to include a regulation National Hockey League rink, 200 feet by 85 feet, four public locker rooms with shower facilities, and two larger private locker rooms that can serve as home base for area high school or travel hockey teams. The additional sheet of ice will provide approximately 80 weekly hours for the high demand programming at the facility. 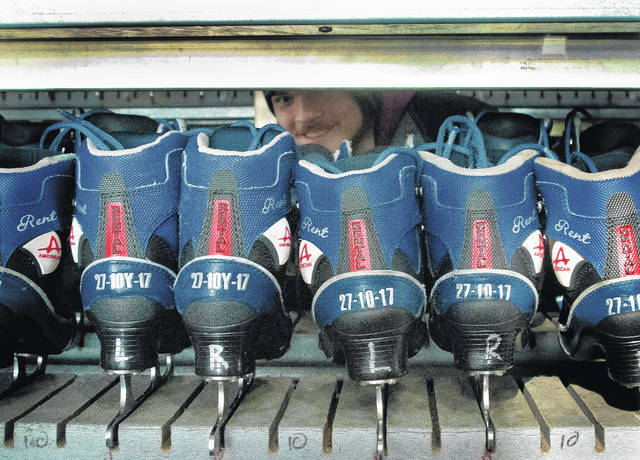 However, with more ice, there will be more skates that Jason Beath will be handing out to the customers of the rink or putting back on the shelf as they are returned. With demand for ice at unprecedented levels in Central Ohio, the OhioHealth Chiller Ice Rinks and JMAC, Inc., parent company of the Chillers and National Hockey League’s Columbus Blue Jackets, have announced plans to add a third ice sheet at Chiller North, located in Lewis Center. Construction will begin soon with the goal of opening the new ice surface in December 2018. The expansion at Chiller North, which will encompass approximately 30,000 square feet at a cost of $5 million, will be the third major Chiller project overseen by Rodgers Incorporated, including construction of Chiller North in 2004 and the NTPRD Chiller in Springfield in 2014. The Chiller North expansion will add one regulation National Hockey League rink, 200 feet by 85 feet, four public locker rooms with shower facilities, as well as two larger private locker rooms that can serve as home base for area high school or travel hockey teams. The additional sheet of ice will provide approximately 80 weekly hours for high demand programming at the facility. Chiller North is home to several area high school, youth, and travel hockey programs. Additional programs include the Blue Jackets Hockey School, Jr. Jackets Learn to Play and Learn to Skate classes, the Chiller Adult Hockey League, public skating sessions, birthday parties, and private group rentals. Mike Priest, president of JMAC, Inc. and the Blue Jackets, said growing the game of hockey at a grassroots level through participation opportunities has been a long-term commitment and passion of the McConnell family and the NHL club. In 1993, there was one two-rink Chiller facility located in Dublin and one youth hockey association comprised of 200 players, along with one varsity high school team, six adult teams made up of 100 players, and 1,000 participants in skating and hockey classes. In 2018, there are nine rinks at six Chiller facilities and six youth hockey organizations made up of over 3,000 players, along with 12 varsity, 16 junior varsity and five club programs for high school student-athletes, 209 adult teams with over 3,000 players and over 50,000 participants in skating and hockey classes. An estimated, 1,000,000 guests visit the OhioHealth Chiller Ice Rinks each year. The Chillers Ice Rinks were established in 1993 with the opening of the Dublin location, which was the first of now six facilities including: Easton, Worthington, North in Lewis Center, and Springfield, as well as the OhioHealth Ice Haus, the Blue Jackets’ practice rink at Nationwide Arena.